Mostly praised, but sometimes also criticized by its customers, the Absolute II Squirrel Proof Bird Feeder is for sure among the top-ten "most talked about" squirrel proof feeders you can buy online. As you can probably conclude from the feeder name, the "Absolute II" feeder model has its older brother named Absolute Squirrel Proof Bird Feeder. This old model has been (and still is) sold all over USA with great success for past couple of decades. The Absolute II is improved version of the Absolute and it is likely to precede its brother in both birth feeding and squirrel-proof functionality. Both Absolute and Absolute II are produced by "Heritage Farms", a small family company from Illinois. The feeder and all of the feeder parts are made in USA and the producer offers 5 years warranty period for this feeder. The Absolute II feeder features really clever design. At the first look, it closely resembles ordinary bird house and the birds love it! But there so much more to it. This "bird house" has transparent windows on both sides (please check the above image) so that the birds get easily attracted when spot all the food inside. But that's not the only purpose of the windows - the windows are also the seed level indicator so you can easily decide if the refill is necessary. By its construction, The Absolute II is metal bird feeder. Its robust housing is made of powder coated steel to stand the test of time for literally several decades. Feeder's food reservoir has volume of 2 gallons and may hold up to 12 lbs. of bird seed. Even when in groups, the birds will find enough space and comfortable accommodation on two feeder roosts and may enjoy total of 14 feeding holes (seven holes on each side). 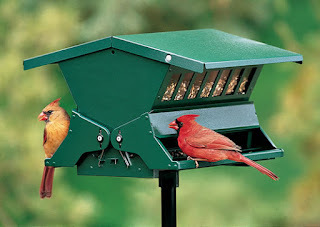 Another unique feature of this feeder is that it has been designed for both hanging and pole mounting and you can fit it in your garden or your backyard any way you want! Good news is that you don't need to buy hanging or pole hardware accessories separately from feeder because those are included in package along with the feeder. Having all necessary and original hardware around may come handy if you change your mind about mounting preferences. Also, this way you'll avoid the risk of incompatibility between the feeder and mounting hardware. As shown in the picture to the left, the core principle of feeder squirrel-proof mechanism lies in the amount of weight that's been put against the feeder's roost. The birds are light by nature and not even several of them may weight as much as a single squirrel. That's why the birds can not activate anti-squirrel protection. But when the squirrel hops on the roost, the weight-sensitive spring activates the lever that lowers the roost and shuts the closes feeding ports at the same time. The triggering weight of squirrel-proof mechanism is fully adjustable, so you can even shut down the food access not only to the squirrels, but also to the bigger birds too. This means you can set this feeder to act like bird feeder for small birds only. The raccoon, rats and similar animal intruders would be disappointed and left without dinner if attacked this feeder as well. 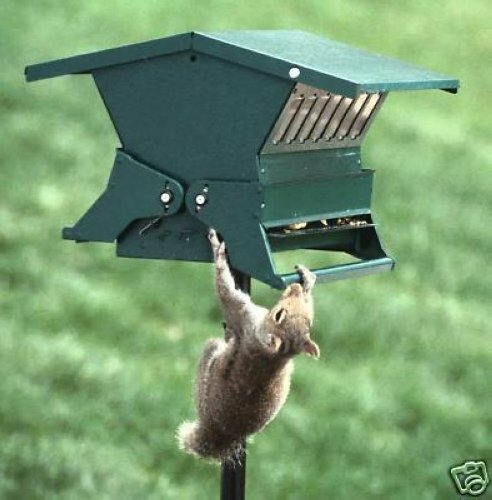 Where to buy Absolute II Squirrel Proof Feeder? For the best deals on Absolute II Squirrel Proof Feeder please check this Amazon.com link. Also, for more reviews about this feeder please check what people who already bought it have to say. It is great to Buy Bird Food Online because you can get many suggestions and options.